Over the past few weeks at work I have come to understand what it means to be "living for the weekend". Working a full time job means there is little time to actually do things during the week, so I've been trying to do as much as is humanly possible with my weekends here in Paris. This weekend started with a night out at Showcase, an amazing club which just so happens to be underneath my favourite bridge in Paris. A night out in Paris is not actually as expensive as I thought it would be, I don't know how I'll go back to student life in the UK after a year of starting the night predrinking under the Eiffel Tower with a bottle of €1,46 wine! I've found that most clubs here have free entry before midnight/1:30 if you sign up on their website, yet drinks can be expensive at around €10-€12 for a single. I actually enjoyed Showcase so much (even if the music was slightly strange) I went back again on Saturday night with another group of pals. 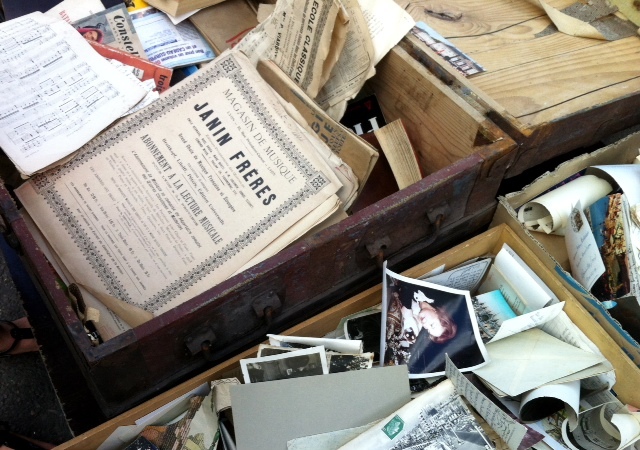 Waking up this morning with a hangover that was only to be expected from a bottle of wine that cost under €2, I met up with some of my best pals here in Paris and headed on up to the Marchés aux Puces (flea markets) in Porte du Clignancourt. 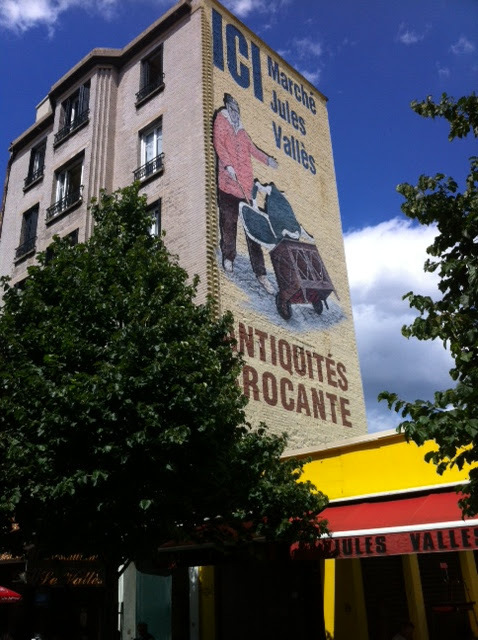 On the other side of the Boulevard Périphérique, getting into Banlieue territory! 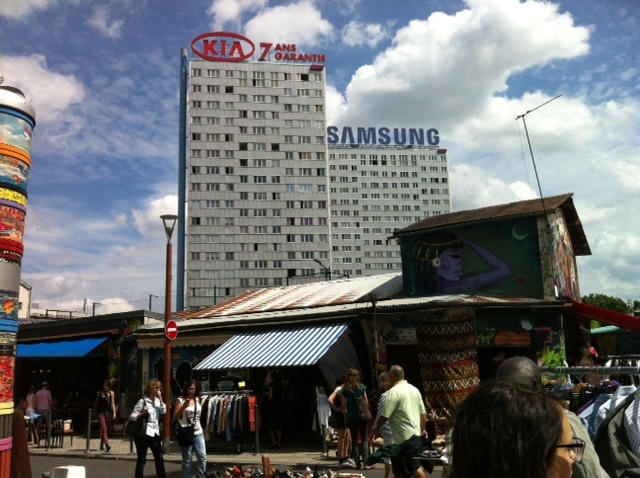 Without wanting to get too political, there's something quite surreal about going from the glamour of the Champs Elysées and the Grands Magasins to an area in which street vendors are trying to make a living by selling knock-off handbags and phones. It was obviously a poorer neighbourhood and I suppose it's the same in any big city, but as you can see in the photo above, to have these housing estates with huge logos on top of them just feels a bit...weird. Although I didn't actually buy anything, apart from a reasonably priced Coke Zero from a cute little street food stall, I really enjoyed looking through all the old magazines in the market (despite not finding a single ELLE!). They had copies of old fashion magazines dating from 1946 I think, and they were around €8, which I didn't think was too bad considering how well they had been kept. 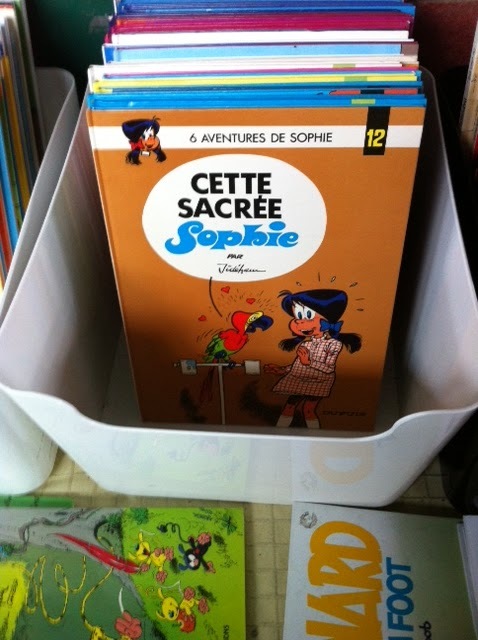 The excitement of finding a "Bande Dessinée" about the 6 Adventures of Sophie! I had a great weekend venturing out of my Parisian bubble, now I'm just planning what to do next weekend! Did you buy the Adventures of Sophie?